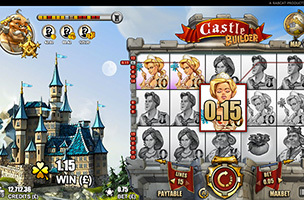 Vienna-based Rabcat has announced the international availability of its popular real-money gambling title Castle Builder. It’s the company’s second release using Odobo’s game development kit, which helps optimize games for desktop, tablet or mobile devices via HTML5. Odobo focuses on HTML5 game development for the real-money gambling industry. Castle Builder was released in the Austrian market in January 2013, via Austrian Lottery operator win2day. The game takes players to a medieval land of fantasy, filled with knights and princesses, and combines real-money gaming with “social game” features. That is, the game offers levels and challenges, like those in popular mobile / social titles. “Castle Builder is the most innovative, challenging and compelling game we’ve ever developed. We’re proud that, through the Odobo platform, we’re now able to bring this successful game to an international audience,” said Rabcat’s CEO, Thomas Schleischitz. The game was inspired by a day spent at the beach building sandcastles, and sees players building castles and making royal love-matches as they head towards the perfect “royal wedding” bonus round. Castle Builder is available to play for free on Odobo Play, and as a real-money mobile game through UK-based portal bet365.